I’ve been making kimchi on a frequent basis now for almost three years. Each time I make kimchi, I tweak the recipe. I’ll add something new or take something out. Then I’ll increase or reduce the quantity of other ingredients. I play with the salt level and the spiciness. My tweaking has landed me on a new recipe which I am calling Kimchi 2.0. As great as my old kimchi recipes have been, this one is has a more complex flavor. I love it and some of the early feedback I’ve gotten from friends has been very positive. Here are the changes I’ve made. Green cabbage vs Nappa cabbage: Koreans use Nappa cabbage and FireFly Kitchens uses green cabbage. For the most part I actually prefer green slightly. Then I started mixing the two and came up with my ideal ratio which is 2 parts green cabbage (sliced thin) and 1 part Nappa cabbage (larger pieces). More Ginger, Less Garlic: I’m learning that garlic is really not that important to kimchi. I discovered this when I ran out of garlic and continued making the kimchi. I didn’t miss it at all and it turned out excellent. As for the ginger – add more. Two Spices: Korean red pepper flakes in my opinion can sometimes need help when it comes to developing a deeper more complex spiciness. If you add more Korean red pepper flakes, it doesn’t get that much more spicy, it just gnaws at your gut. These days I’ve scaled back on the Korean Red pepper flakes and I add a small amount of Extra Hot chili powder, which I acquired at an Indian grocery store. More Salt: In early posts I mentioned using 1/2 tablespoon of salt per pound of cabbage. Besides preserving crunch and extending fermentation times, I’ve discovered that adding a bit more salt accents the Korean red pepper flavor. When you use too little, the flavor tends to disappear too fast. Now I use 2/3 to 3/4 tablespoons of salt per pound of cabbage. I use more salt in the summer and less in the winter when my kitchen is cold. Mustard Leaf: My secret weapon. When I was sampling the different kimchi options at the great H Mart store, I discovered the wonderful bitter flavor of fermented mustard leaf. You will likely have to go to an Asian market to find this item. Only use Green Onions: When I started making kimchi I used regular onions. Not anymore. Green onions are so much better. Summary: A major version release for my kimchi. Slice green cabbage into ribbons and place into bucket. Cut Nappa Cabbage into large bite size squares and add to bucket. Add sea salt and mix in with hands. Rub that salt into the cabbage. Get in there. Spend a good 10 minutes doing this. Dice daikon and place in bucket. Add the Korean spices and chili powder to bucket. If using garlic, chop it up and throw in bucket. If using carrots, slice thin and throw in bucket. Take a 20+ minute break. 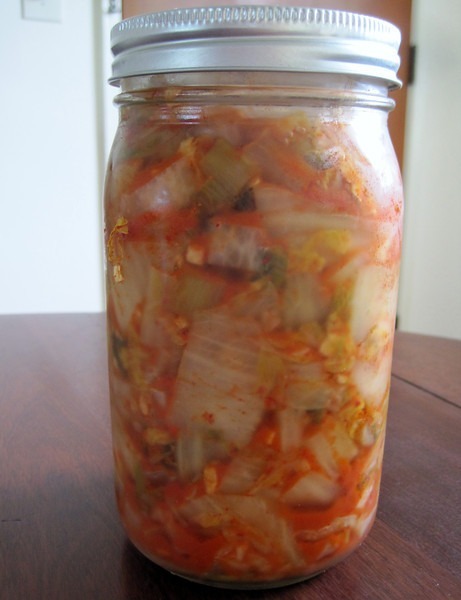 Pack kimchi into jars or crock. Make sure the containers have at least an inch at the top and that the veggies are below the water line. That means you must use the juice from the bucket. Allow kimchi 3-10 days to ferment (see notes below). Every day you will check on your kimchi. You will push the veggies down (yes, I prefer this method to adding weights, but both are fine). Starting around day 2 taste a little bite each day. It will start very crunchy and then soften up. Whenever it tastes good to you is when the ferment is done. I’ve had summer ferments finish in 3 days and winter ones that go 2 weeks. You could go longer. As long as the veggies are below the water line, the ferment can continue. 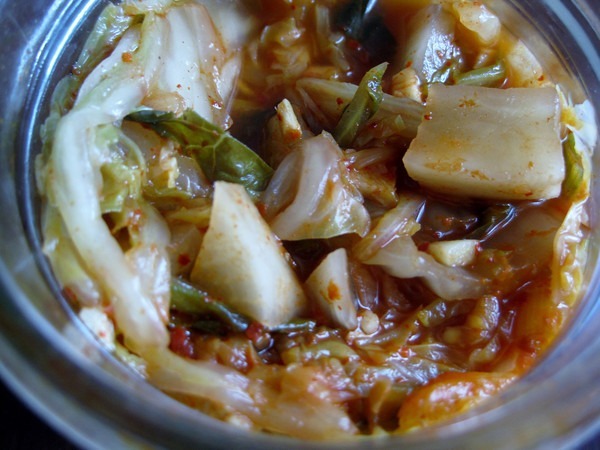 Once you like the taste, move the kimchi into the refrigerator, where it will store fine for many months. For a more detailed explanation of making kimchi see the post Kimchi 101. My next batch will have more green cabbage—as I prefer the Napa variety. This last batch I added on head of green cabbage, and it is pretty tasty. I agree on the garlic/ginger mix. This last batch has less garlic and about half-again as much ginger. On onions, I like to add about half a yellow onion chopped, and I double the green onions. Next batch will add mustard. Thanks for the these posts! @Scott – Good luck with your kimchi adventures! I met you at the last WAPF meeting in Ballard-great blog, I have been trying to work out a format/theme for my own. I like that you simply write about the things that interest you-and that you obviously research extensively. Thanks so much for posting this recipe-I want to try this out myself. @Alice – Glad you like the site. Was nice meeting you as well. Since you are also interested in food and nutrition, check out the Seattle Paleo group. I’m slowly bringing them into the WAPF camp. 🙂 Great people. Save your kimchi juice it can be used a jump starter for kimchi fermentation. Fermentation time should be reduced. Another way is to buy vegetable starter. I made kim chi for the first time using your recipe. I let mine ferment for 48hrs and it tasted perfect when I refrigerated it. However, barely a week later, it’s much too sour. it has been under refrigeration the entire week. And I thought that it continued to ferment very slowly once refrigerated?? What am i doing wrong? Any suggestions? @Zooie – I would add more salt next time. We are still in the heat of summer, so it is possible your ferment went faster. Salt will slow it down and might reduce the sour taste. You can use sour kimchi for soups. So don’t let it go to waste. I just followed your recipe here – it was fabulous. However.. I added the two tablespoons of salt and did not rinse the cabbage… The end result was incredibly salty. Is there a good way to remedy this? I was thinking maybe I could make another batch without salt and combine them? I only made the first batch yesterday. Any help would be appreciated! The flavor is great otherwise, I would be sad if I had to start all over! @Anya – It is good practice to taste before you jar. The best thing to do with salty kimchi is make soup with it. I add water, sometimes more veggies and then a protein. Shrimp or even sliced SPAM. Rice noodles or Korean rice cakes are good to add as well.